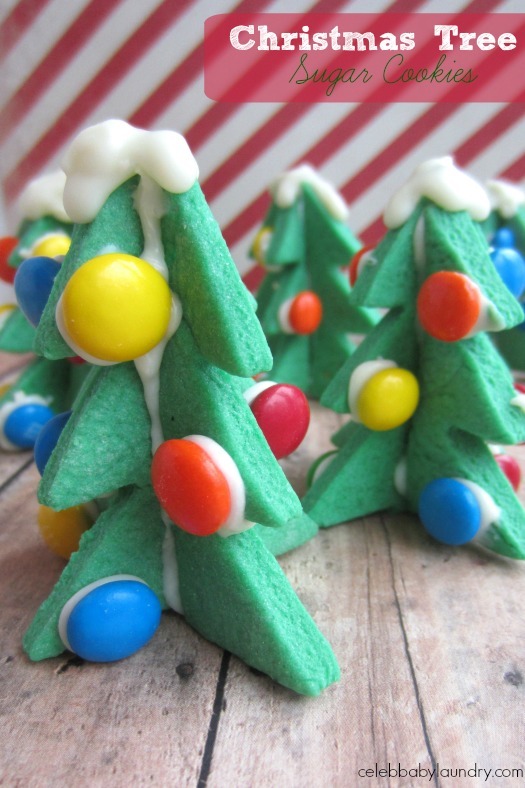 Sugar cookies are always popular when it comes to baking festive holiday recipes. They are easy to make and allow you to create an array of holiday themed designs. 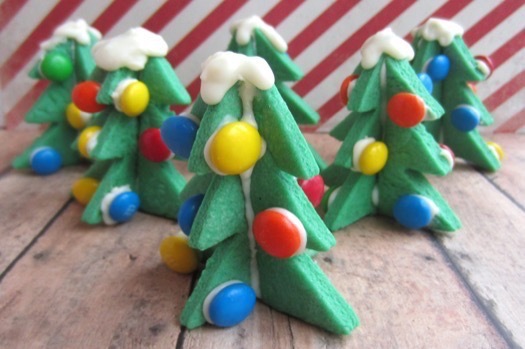 Try these 3D Christmas Tree Sugar Cookies for a new take on the traditional cookie cutter version. The cookies are great to eat or put on display around the house. 1. In a large mixing bowl, beat butter and sugar until well combined. Scrape sides and bottom of bowl, then beat in your baking powder, egg, vanilla and green food coloring. Mix until desired color is achieved. On low speed, slowly begin adding the flour. Stop and scrape bottom and sides of bowl as necessary. The more food coloring you added, the more flour you will need. Continue mixing until dough is firm. Remove dough from bowl and divide into 2 balls. Place dough in refrigerator and let chill for about an hour or so. 2. Remove dough from refrigerator and preheat oven to 375 degrees. 3. On a lightly floured surface, begin to roll out first ball of cookie dough. Roll it out no thinner than ¼ inch. You are going to want the cookies on the thicker side so they hold their shape. 4. 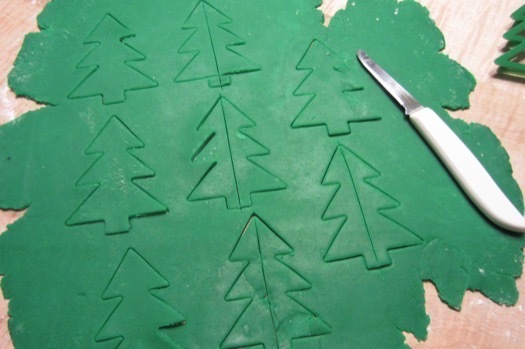 Using your Christmas tree shaped cookie cutter, begin to cut shapes in the dough. Do not remove yet! Using a paring knife, cut a straight line down the center of half the tree shapes. Using the same knife, cut a straight line across the bottom of all trees to remove the trunk. Removing the trunk will allow the cookies to be freestanding when finished. 5. Carefully remove trees and halves, and place them on an ungreased cookie sheet. Leave about an inch or so of space between. Bake for 7-9 minutes. Keep a close eye on them as they approach the last few minutes. You’re going to want to pull them out before they begin to brown. 7 minutes was the magic number for me. 6. Let cookies cool on the sheet for a minute or two before moving to a wire rack. 7. Repeat the process with the remaining dough. 1. 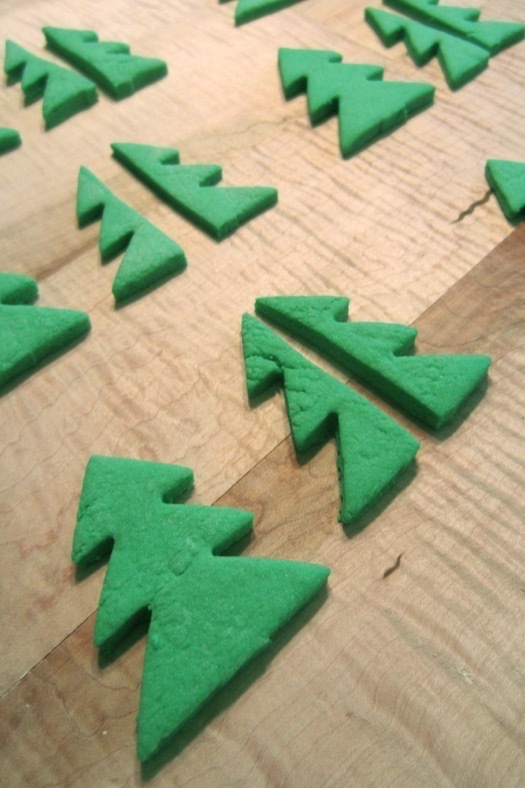 Once cookies are completely cooled, lay out your trees with corresponding halves. This just makes the assembly process easier. 2. In a double boiler, or in the microwave, melt the chocolate chips. I used a plastic sandwich bag for my assembly, but you can use a spoon, toothpick or whatever you like for this part. 3. Add drops of the melted white chocolate where you’d like the M&M’s to go. I did 2 trees at a time. Add the M&M’s, hold in place and let cool for a couple of seconds. Let chocolate cool and harden before turning over. I left them sit for about 15 minutes. Flip over and repeat. 4. Apply a thin layer of the melted white chocolate to one of the tree halves. (You may need to remelt the chocolate at this point.) Place the chocolate side on the directly down the center of your whole tree. Hold in place for about 10 seconds or so, just to make sure the chocolate cools enough to keep it in place. Let cool for about 10 minutes. You can place them in refrigerator to speed up the process. 5. Repeat the previous step with the other side of the trees, only this time, stand them up to let cool. 6. Apply melted white chocolate in desired areas of the tree. Let cool completely. 7. Put out for display or eat!